The Daily Telegraph reports a poll suggesting '86 per cent of people who voted for Nigel Farage’s party will do so again next year'. I'm not sure this is a particularly valid reading of the poll (commissioned, incidentally, by UKIP's financial backer Paul Sykes). What the poll results actually show is that 37 per cent will 'certainly' vote UKIP at the next general election, and 49 per cent said they were 'likely' so to do. I think we can assume that a fair chunk of that second group shouldn't be taken for granted. But let's start by taking the Telegraph interpretation at face value. That would give UKIP the votes of 3.76 million people at a general election. A very impressive result, four times as large as the vote they got in 2010. And if the Lib Dem support collapses from the 6.8 million achieved last time, it might be enough to put UKIP in third place in the popular vote - though almost certainly not in number of seats. On the basis of this poll, there are Conservative MPs and some rightwing commentators (such as Simon Heffer) suggesting that the Conservatives need to make some kind of electoral pact with UKIP. This would be a mistake for UKIP. The point of a third party in the British electoral system is to provide a repository for protest votes from across the political and class spectrum. As soon as such a party does a deal with one of the two major parties, it removes a large chunk of that support. That's the problem the Lib Dems are now suffering from. All those who cast a vote for the Lib Dems from the left now feel like they were betrayed. That would have been mirrored - to a slightly smaller extent - on the right if the party had gone into coalition with Labour. Why would UKIP want to drive away those voters who want nothing to do with the Tories? And for the Tories? A governing party doing a deal with a party that has no MPs hardly looks like a statement of strength. Heffer argues that a precedent exists with the relationship between the Conservatives and the National Liberals in 1951, but it's not very convincing. Apart from it all being a long time ago, in a different political world, the Tories were then in opposition, and the National Liberals had sixteen MPs to bring to the feast. Oh, and the Conservative Party was led by Winston Churchill - the electorate didn't believe for a second that he was a dog that any tail would wag. To put it mildly, David Cameron is not as convincing a leader. Some sort of electoral deal between the Tories and the Lib Dems is possible, but not between the Tories and UKIP. Which, despite all their denials, leaves the latter as a passing protest. In the excited heat of the moment, comparisons are being made in some quarters between UKIP and the SDP/Liberal Alliance three decades ago. But the Alliance got around 7.5 million votes in 1983 and in 1987. That's well out of reach. Here's my guess for the 2015 election. UKIP will get around 2.5 million votes and fewer than five MPs (quite possibly none at all). As UKIP win a European Parliament seat in Scotland, Alex Salmond criticises the London-centric BBC for giving the party publicity north of the border, and thereby encouraging people to see that there might be an alternative. Meanwhile, commentators from Janet Daley to Rod Liddle berate the London-centric BBC for not understanding the depth of feeling that produced a strong UKIP vote. So that's the election to the European Parliament pretty much done and dusted for another four years. The final results from Scotland and all of those from Northern Ireland have yet to come in, but they're not going to make much difference to the UKIP vote, which turns out to be around 4.35 million people, pretty much where I said they should have been. This is the important figure: not the share of the vote, but the raw number of voters. Because, while many, many more people will turn out for each of the three main parties in a general election, this is high tide for UKIP - if you didn't vote for them last Thursday, you're unlikely to do so next year. Unless, of course, the party changes radically. If UKIP is to get any further, it's going to have to make greater inroads into old Labour territory. And that probably means thanking Nigel Farage for all he's done, but telling him that he's gone as far as he can. A bit like Ian Holloway, he might get you promoted to the Premier League, but he won't keep you there. Or you could see him as the Moses of politics, the man chosen to lead his people back to their promised land but destined not to take the final step himself. But that's a tad heroic, as a comparison. Just as a postscript, it's a pleasure to see erstwhile Mail Online blogger, Janice Atkinson-Small, elected as a UKIP MEP. At last, one of the great heroes of this blog is to get a decent income from the state. It's 'a political earthquake', according to Nigel Farage. Well, er, up to a point. As I write this, not all the results have been declared in the local council elections, but the majority are in. And of the 2,886 seats announced so far, UKIP have taken just under five per cent of them. Not really time just yet to go back to your constituencies to prepare for government. I love election day. Even when it's only for members of the European Parliament, an occasion that's always spoiled a bit by not getting the results until the following Sunday. So I've been out to do my voting and was somewhat surprised to find that there were other parties putting up candidates apart from UKIP. Judging by the coverage in the Guardian and the Daily Telegraph (the two papers I read most frequently), I had thought this was a one-horse race, but it turns out that other people fancy their chances as well. Last time round, in 2009, UKIP got around 2.5 million votes in the Euro-elections. The BNP got nearly 1 million, most of which - I assume - are now available, while many of the 2 million who voted LibDem (when that party was still in opposition) will also be looking for somewhere else to register a protest. Combined with the blanket media coverage, that means that UKIP should be very disappointed if they fall short of 4 million votes today; and they should be getting around 4.5 million. And that, I suspect, is going to be their highpoint in their current form. If you don't vote UKIP this time, you're unlikely to do so at a general election next year. There's a chance that they might hit 30 per cent of the vote today, but on a general election turnout the same number of voters would produce around 14 per cent. And even that's optimistic. Not that UKIP are irrelevant or unimportant. It seems to me that Nigel Farage is asking some very pertinent questions. It's just that UKIP don't have the answers. And nor, unfortunately, do any of the other parties, which is why they're so desperate to shout 'racist' in the hope that the questions aren't heard. This won't work. It will quite possibly restrict the possibility of UKIP support growing any further, but it leaves the problems untouched. At the heart of those problems, the issue that resonates most strongly is quite clearly not Europe but immigration. And, for those who would like to see a Left alternative in Britain, the question that needs answering is: what benefit does the presence of large numbers of, say, Polish workers in the country bring to the British working class? The typical Left response is that this is the wrong issue, that it's low wages, bad employment practices and underinvestment in social infrastructure that should really be the focus. Which may well be true, but isn't an answer; it's just telling people that they don't understand their lives well enough to ask the right question. The real issue for the Left is why it's a rightwing party that's attracting the protest votes of the dissatisfied. The standard allegation is that UKIP are exploiting people's fears, which merely raises further questions: Is 'exploit' the correct word, or should it be 'articulate'? Is it fear or dislike? Powell's last contribution to British politics came in 1993 when he spoke on behalf of Alan Sked in the Newbury by-election. The man deputed to give him a lift to and from the constituency on that occasion was Nigel Farage. So inspired was Farage by Powell's arguments during their journey that he resolved to dedicate himself to a career in politics. Two decades later, and he seems to be doing alright for himself. The fact that we seem to be going round and round the same issue decade after decade might be perceived as being a little depressing. So, to end on a cheery note: a fortnight after the 'rivers of blood', a poll found that 74 per cent of the British population supported Powell's views on immigration. If that were still the case, then Farage would be doing a whole lot better than he is. What a pleasure it was to hear Nick Griffin again on Radio 5 Live this morning. I'd forgotten he was still with us, indeed that he's still an MEP (for another week at least). If dictionaries could talk, their definition of a busted flush would sound just like Griffin did today. Hard to remember how big a bogeyman he was just five years ago, when the BNP were on the rise. As one might imagine, there was no attempt on the part of Nicky Campbell to conceal his loathing of Griffin in the interview (and I use the word loosely), but it felt a bit like kicking a blind beggar. The BNP thunder has long since been stolen by UKIP, and Griffin was just flailing wildly as he sinks into irrelevance. One of the few points he managed to get in, during his allotted three minutes, was a claim that the BNP's poll ratings had gone up after he appeared on BBC One's Question Time in 2009. Having just checked, it's clear that he's not entirely lying, though there is an element of exaggeration. Which reminded me of Nigel Farage on Question Time last week. That appearance provoked complaints on Twitter and elsewhere about how much airtime the UKIP leader was getting, but the reason for that was simple: all the other panellists had decided to gang up on him. Just as they did against Griffin five years ago. And if the response to someone as personally unappealing as Griffin was to increase his poll ratings, what is the likely effect when the same tactic is applied to Farage? It seems that no one learns. If a fringe politician makes as his central appeal a claim to be against the establishment, then it does him no harm at all when the establishment behaves in such a way as to demonstrate that point for him on national television. I've said here before that I've never believed Ed Miliband was capable of winning the next general election. I still don't believe he will. And part of the reason for that belief is contained in his much heralded big speech on the NHS yesterday. Firstly, it's not a good sign that - a week before European and local elections - Miliband feels the need to scurry back to Labour's comfort zone of the NHS. It's got nothing to do with this round of elections. 1) Some old people hurt themselves in falls, but we can prevent this from happening by installing grab-rails in their homes. 2) Under a Labour government, there would be 'a guaranteed GP appointment for all within 48 hours'. 3) There will be a reduction in competition within the NHS, a scaling back of consultancy costs and a repeal of the NHS and Social Care Bill - all of which will save 'at least £100 million'. The budget for the NHS in England alone is roughly £100 billion. The projected savings amount to 0.1 per cent. It would be nice to see a GP when you actually want to see them, but in my anecdotal experience, no one I know has had any satisfaction from seeing a GP in years. Lord knows what they learn during those long years of study, but over the last decade they seem to have turned into little more than receptionists and the best you can hope for is a referral to someone else. I'd be more impressed by a promise to improve the service that was on offer. Even an assurance that during a consultation your GP looked at you, rather than at a screen, would be a start. On the other hand, the grab-rail promise is a surefire winner. It's a terrific idea. As good today as it was when Miliband first came up with it two months ago. So, having abandoned any of the issues that he should be talking about in the run-up to the elections next week, this is the best that Labour can come up with. Truly it's pitiful. But of course, this isn't the real reason why Miliband won't win a general election. This is just a symptom. The main problem is that ever since, oh about 2010, it's been impossible to see where the new voters were going to come from. Labour hit a level of support in the polls that seemed to stand no chance whatsoever of going up. Miliband doesn't look even vaguely like a prime minister. He still doesn't even look like the leader of the opposition. To overcome that, he needs to present a really serious alternative, and this ain't it. There was a long gap between my last two posts here, but I wouldn't want anyone thinking I've been entirely idle. 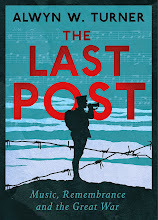 Apart from doing my various day-jobs, I've also been writing a book on the story of the Last Post bugle call, due out later this year And the early indications are that it's one of my better efforts. I think. Twenty years on from the death of John Smith, on 12 May 1994, and it's almost as though he never existed. Admittedly he was the leader of the Labour Party, in opposition, for only just under two years, and served in cabinet - as trade secretary - for barely six months, in the dying days of Jim Callaghan's government in the 1970s. But he was a significant figure and deserves a higher standing than I think he currently enjoys. By the time Smith's leadership was cut short by his heart attack, that talk seemed a long way distant. Opinion polls had Labour with a twenty-point lead over the Tories, and were showing that nearly 80 per cent of the electorate agreed with the statement 'Labour is a much more moderate and sensible party than it used to be'. He had changed the party, and the public perception of the party, leaving a perfect legacy for his successor, Tony Blair. Victory in the next general election, whenever it came, was certain. And that felt about right. He seemed quite comfortable generally: unflappable, reassuring and convivial. He was unmistakeably part of the Labour movement, but couldn't be painted as an extremist. He gave the appearance of speaking common sense; to quote Tony Wright again, he had 'the great gift of making ideological declarations sound like a request to call and rad the gas meter'. In a nice tribute to Smith, published today in the Guardian, John McTernan argues - I think correctly - that he would have been a successful prime minister. He wouldn't have won such a big majority in 1997 as did Blair, but he would have made far better use of it. McTernan suggests he would have gone on to win a second term and, having refused to join America in the invasion of Iraq, a third. I'm not quite so sure about that last bit. He would have been in his mid-sixties by then, and I suspect pressure from the next generation would have persuaded him to stand down before attempting a third election. There were some notably disloyal members of that generation - primarily Tony Blair, Gordon Brown and Peter Mandelson - who took great delight in plotting and in undermining those with whom they didn't agree. Indeed even during Smith's brief tenure, there was a lot of talk about a potential coup by Brown and Blair to oust him from the leadership. But all this praise shouldn't obscure the one great failing of Smith. Apart from his own personal virtues, the other reason why he made such extraordinary progress in the polls after 1992 - and one of the reasons why the Conservatives haven't won an election since then - was Black Wednesday, when Britain was forced out of the ERM. This gift for an opposition landed in Smith's lap within a month of him taking over the leadership. The Tories' reputation for economic competence (which had somehow, miraculously, survived two massive recessions) was severely damaged and is only now recovering. John Major, claimed Smith, had become 'the devalued prime minister of a devalued government'. But Smith himself had been on the same side of that argument as had Major. As shadow chancellor, he had been an enthusiastic cheerleader for the ERM. He was wrong. And it was quite a big thing to have been wrong on - probably the most important policy decision of the time. Worse still, he gave no indication of recognising that he had been wrong. His enthusiasm for the European project - going all the way back to that vote in 1971 - overrode other considerations, and it's hard to avoid the conclusion that, had he been elected prime minister, he would have made the same mistake again, but on a larger scale. Under a government led by John Smith, Britain would almost certainly have been in the first wave of countries joining the single currency. Which, ultimately, is why, in John Smith, the Labour Party chose the wrong man to succeed Neil Kinnock. The right choice - as I've claimed here before - was the only other candidate in the leadership election, Bryan Gould. For an account of how that would have turned out, can I direct you to the Inane Ramblings of a History Graduate.